Reinhard Justus Reginald Selten (5 October 1930 – 23 August 2016) was a German economist. He won the 1994 Nobel Memorial Prize in Economic Sciences (shared with John Harsanyi and John Nash). He is also well known for his work in bounded rationality and can be thought as one of the founding fathers of experimental economics. 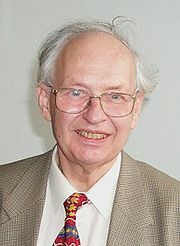 Selten was professor emeritus at the University of Bonn, Germany. Selten, who was partly Jewish, died on 23 August 2016 in Poznań, Poland, aged 85. ↑ Roberts, Sam, "Reinhard Selten, Whose Strides in Game Theory Led to a Nobel, Dies at 85", New York Times, September 2, 2016. Retrieved 2016-09-03. Economista alemán, nacido en Breslau (actualmente Wroclaw, en Polonia). Reinhard Selten (1930– ). The Concise Encyclopedia of Economics. Library of Economics and Liberty (2nd ed.). Liberty Fund. 2008. This page was last changed on 7 October 2017, at 13:29.